Not all liquids are created equal. The level of some contained liquids is easy to detect, while other liquids create a heavy foam or vapors that can cause problems for ultrasonic level sensors. Ultrasonic sensors use sound waves to measure the level of the liquid. 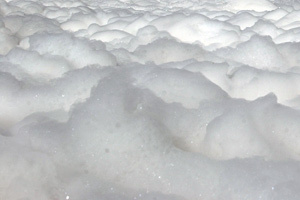 Heavy foam can absorb the sound wave, causing false or no readings. While some ultrasonic sensors have different filters and setting to help eliminate the false readings, foam is what it is and will usually win. Vapors from the liquids can also result in problems for a non-contact sensor. Vapors create different air densities, causing the sound wave to change as it goes through the different layers. The accuracy of the sensor goes way down, if the sensor gets a reading at all. Resistive chain technology uses internal reed switches that read where the float is on the stem of the sensor. A resistive chain sensor will give a reliable and accurate reading of the liquid. Magnetostrictive sensors also read the float on the stem to give reliable accurate readings, but are more accurate. The key to either of these sensors is to know the specific gravity of the liquid. With the specific gravity, we can pick the correct float for the application. The float will sink through the foam and float on the liquid. Floats are not affected by the vapors either. Additionally, a submersible pressure transducer is a suitable choice. These sensors sink to the bottom of the tank or vessel, and measure the pressure exerted by the volume of liquid. This is translated to a level reading. Contact us to discuss how contact level sensors such as resistive chain, magnetostrictive, or submersible pressure transducers can help you and your company. We'll help you sort through which sensor is best for your application.